The first time Nancy and Craig Waikem of Massillon, Ohio, were introduced to canine cancer was in 2013. It was “the hardest thing in the world,” recalls Nancy. Between all of the steroids and side effects, the Waikems were left feeling sad and defeated. And while their first experience ended tragically, their most recent encounter with pet cancer has been just the opposite. 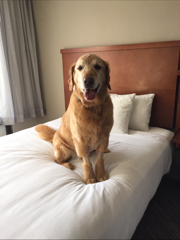 Their current pet, a 7-year-old Golden Retriever named Mark, was taken to his family veterinarian after experiencing multiple seizures. An MRI/CAT scan revealed that Mark had an acorn-sized brain tumor (meningioma) between his eyes and above his nose. Given the Waikems’ previous experience, they were reluctant to pursue conventional radiation therapy that would have required months of treatments, brain surgery that would have required the skull to be cracked open for access, or the palliative care and heavy steroids they dealt with the first time around. Fortunately, by the time Mark was diagnosed with his brain tumor in January 2016, the landscape had changed – turning their defeat into hope. 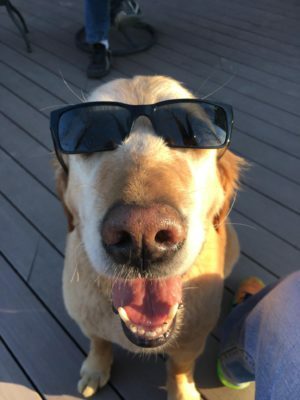 Thanks to amazing advances in veterinary medicine, a new, game-changing cancer treatment called stereotactic radiosurgery (SRS) provided an encouraging treatment option for Mark’s tumor. 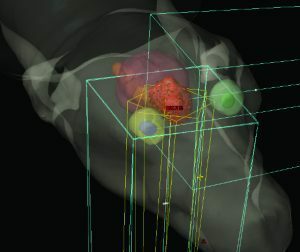 SRS could target and deliver radiation to the tumor with sub-millimeter precision, and would require significantly fewer treatment sessions compared to conventional radiation therapy. In their minds, the choice was easy. “I just had to do it for my kid,” said Nancy, emphasizing that the reduction in sessions – and, therefore, anesthetic events – was an important factor. She brought Mark to PetCure Oncology at Care Center in Cincinnati, the only facility within a 400-mile radius that is capable of delivering SRS for pets. They were on their way back home just three days later after completing his entire treatment course – just one fraction of SRS. Mark relaxing at a hotel pre-treatment. Their beloved dog is now a happy, healthy cancer survivor. We checked back in with Mark in March of 2018, and he’s now 11 years old! After his SRS treatment for a brain tumor two years ago, he’s still talking to people (with a toy or shoe in mouth) and playing frisbee! Brain tumors occur in both humans and pets. Seizures are the most common indication of brain tumors. Other symptoms may include unusual behavior or temperament, vision problems, movement in circles, uncoordinated movement, unsteady gait, lack of appetite, inappropriate urination or lethargy. If you have any concerns or need medical advice regarding your pet, please consult with your family veterinarian. If you would like to make an appointment with a PetCure Oncology center near you, please visit our Make an Appointment page.